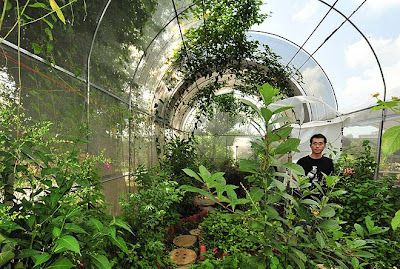 It has been a year since the launch of the Butterfly Lodge at Oh’ Farms on 9 Aug 2008. Last Sunday, on the day when Singapore was celebrating its 44th National Day, our friends at Butterfly Lodge, members of Butterfly Circle and a few invited guests also had a gathering to celebrate Butterfly Lodge’s first birthday! We spent the evening in a very casual and carefree setting, chatting and sharing stories about butterflies (of course!). Amidst the laughter and bantering, we could hear the low-frequency throb of helicopters in the nearby skies, returning from the National Day Parade at Marina Bay. With the constant supply of good wine, drinks, beer and delicious food, all of us were so engrossed in our conversations and eating that we did not remember to snap even a single shot. What a pity ! Yeok Keong, the owner of Butterfly Lodge at Oh’ Farms also presented tokens of appreciation to members of ButterflyCircle who had helped in the initial planning and setting up of Butterfly Lodge. 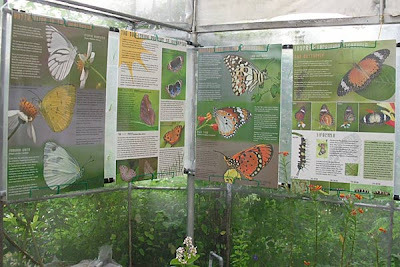 The pictures below show some of the A1 size posters outside the butterfly flight cage (photos on the posters were contributed by ButterflyCircle members). 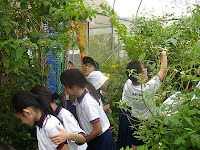 Being the only one of its kind here, Butterfly Lodge features only common local butterfly species with the main aim of promoting butterfly appreciation and awareness amongst school children. 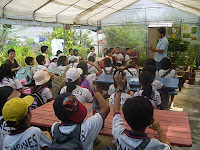 We are proud to report that within a year, about 5000 visitors (mainly from Child Care Centres, Pre-schools and Primary Schools) have visited Butterfly Lodge and attended an introductory lesson related to the life cycles and behaviour of butterflies. 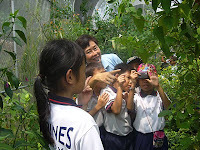 We are glad to say that ButterflyCircle and Butterfly Lodge have created opportunities for kids here to observe the activities in a typical day in the life of a butterfly, such as feeding, sunbathing, performing courtship dance, mating, and laying eggs, up close and personal, creating lasting learning interactive experiences for the kids. How many students these days have the chance to see mating butterfly ? At Butterfly Lodge, visitors can very often observe a live scene of what mating is all about. This presents a very good teachable moment of explaining how a new life begins to our young children. In the enclosure, students may be lucky enough to witness a weird behavior of how a female would reject mating by pointing her abdomen upwards as shown in the picture here. 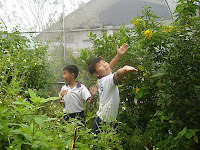 Indeed, we are delighted to learn that some of our young visitors are now able to recognize and identify the butterfly species flying around in their neighbourhoods after their visit to Butterfly Lodge. 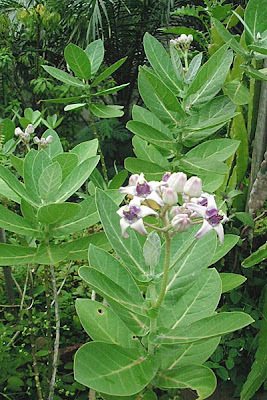 One whole batch of Plain Tiger (Danaus chrysippus chrysippus) larvae were found dead overnight after they were fed with Crown Flower (Calotropis gigantea) leaves supplied from a neighbouring country. We suspected that the leaves might have been contaminated with chemicals that we were not aware of . Butterfly larvae are very susceptible and vulnerable to toxins - even a trace amount of toxin is enough to kill all of them. There was an initial success of breeding the Blue Pansy (Junonia orithya wallacei) in captivity, resulting in good numbers of Blue Pansys in Butterfly Lodge. However, they did not proliferate further after one or two generations. Subsequently, despite a few times of introductions of both male and female Blue Pansys into the enclosure, we have not seen caterpillars yet. We suspect that certain unknown factors in the enclosure environment may have prevented Blue Pansys from mating or laying eggs. Both the male and female Blue Pansy are very pretty and attractive. We will continue to monitor the breeding progress for this species. 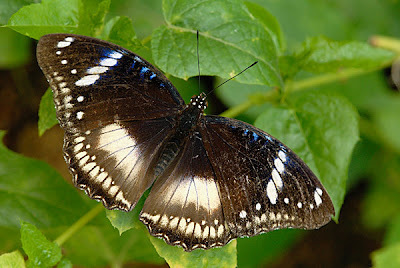 One pair of Jacintha Eggfly (Hypolimnas bolina jacintha) was introduced into the enclosure in Aug 08. The species was doing very well during the first few generations. But, again the number of Jacintha Eggfly larvae dropped drastically over a period of 2 to 3 months. 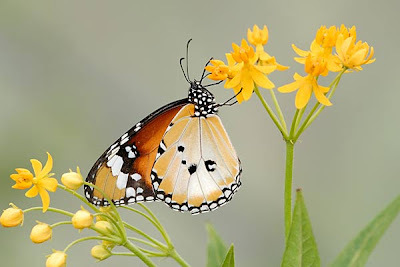 Since late March 2009, there was not a single Jacintha Eggfly left. So we suspect that inbreeding may have a role in causing infertility in the species. A new female form of Jacintha Eggfly? Furthermore, we also observed that a small number of female Jacintha Eggfly in the last one or two generations displaying unusual markings as shown in the picture. Was it due to inbreeding or is there really such a new form that has not been observed before? It was a pleasant discovery that Peacock Pansy utilizes Strobilanthes cubia as a preferred larval host plant in the enclosure despite the presence of Red Flame Ivy (Hemigraphis alternate) and Ruellia repens which are its known host plants in the wild. 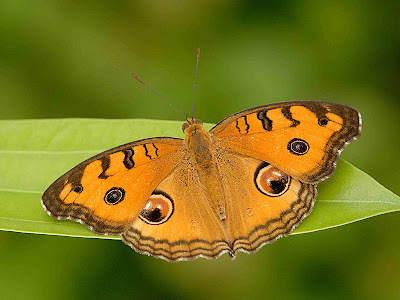 In addition, it was also observed that without enhancing the gene pool with new introductions from outside the flight cage, low fertility rate also affected the population of the Peacock Pansy (Junonia almana javana). Lastly, we also discovered that the life span of some species such as Common Mime (Chilasa clytia clytia ) and Common Birdwing (Troides helena cerberus) was very short (less than a week) in captivity. So these species are not suitable for captive breeding unless the flight cage is high and big enough for them to roam freely. Apart from some minor setbacks, generally, it has been a very successful year for Butterfly Lodge. Looking forward, Butterfly Circle and Butterfly Lodge will continue working together to educate more children and the public in butterfly appreciation. With more people being butterfly-literate, many flying jewels should soon be fluttering in our natural environment for our next generation to appreciate. 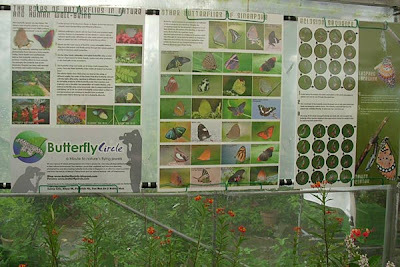 We are also confident that what we have learnt in captive breeding will help in the conservation of some butterfly species in the future.